Inspired by Victoria’s Tapa Bar, these almond-stuffed dates are to die for! 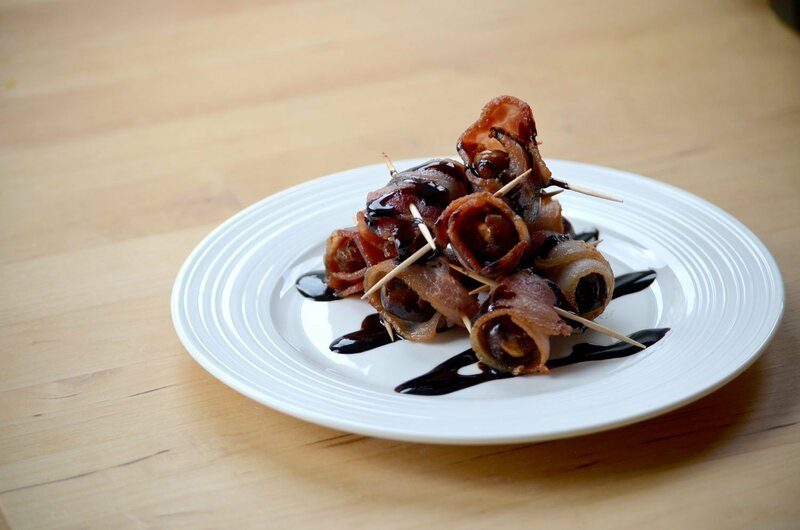 Wrapped in bacon, they are are completely irresistible and will be a huge hit at any party! *If your dates are large, use a full bacon strip per date (24 total) and do not cut in half. **This is a reduced balsamic vinegar. It can be found in the Italian or vinegar section of your local grocery store. Line a rimmed baking sheet with tinfoil. Place bacon on baking sheet and cook for about 15 mins, or until bacon is fully cooked but still pliable. Do not let the bacon get crispy. Once cooked, remove the bacon from the pan and pat dry with paper towel to remove any excess fat. Stuff each date with an almond. If the dates are very large, two almonds may fit. Wrap half a strip of bacon around each date, securing it with a toothpick through the date. Line up wrapped dates on a baking sheet and heat in oven for about 5 mins, or until warm. Drizzle the wrapped dates with balsamic crema and serve.